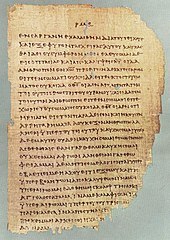 The Gospel According tae Luke (Greek: Τὸ κατὰ Λουκᾶν εὐαγγέλιον, to kata Loukan evangelion), an aw cried the Gospel o Luke, or semply Luke, is the third o the fower canonical Gospels. It tells o the oreegins, birth, meenistry, atonement, daith, resurrection, an ascension o Jesus Christ. ↑ Allen 2009, p. 325. This page wis last eeditit on 12 October 2018, at 19:45.